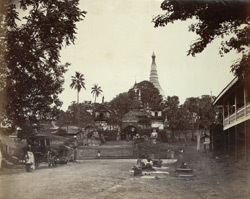 Photograph with a view of the southern entrance and principal approach to the Shwe Dagon Pagoda in Rangoon (Yangon), Burma (Myanmar), taken in about 1868, part of the Dunlop Smith Collection: Sir Charles Aitchison Album of Views in India and Burma. The photograph is unsigned, but it is probably by J. Jackson. The Shwe Dagon is Burma’s most revered Buddhist shrine and stands at the centre of a terraced site on Singuttara Hill. Steps lead to an ornate masonry archway decorated with foliate and scrollwork woodcarving. Beyond this lies a covered staircase surmounted by a line of tiered wooden pyat-that spires which ascends to the pagoda platform. The conical spire of the main shrine, a gilded stupa or zedi, rises above the trees, its spire decorated with a series of bands and lotus leaves culminating in an umbrella or hti at the pinnacle. Two bilus or ogres guard the entrance at either side of the steps and in the foreground vendors at their stalls sell religious offerings for pilgrims to purchase as they enter the temple precinct.